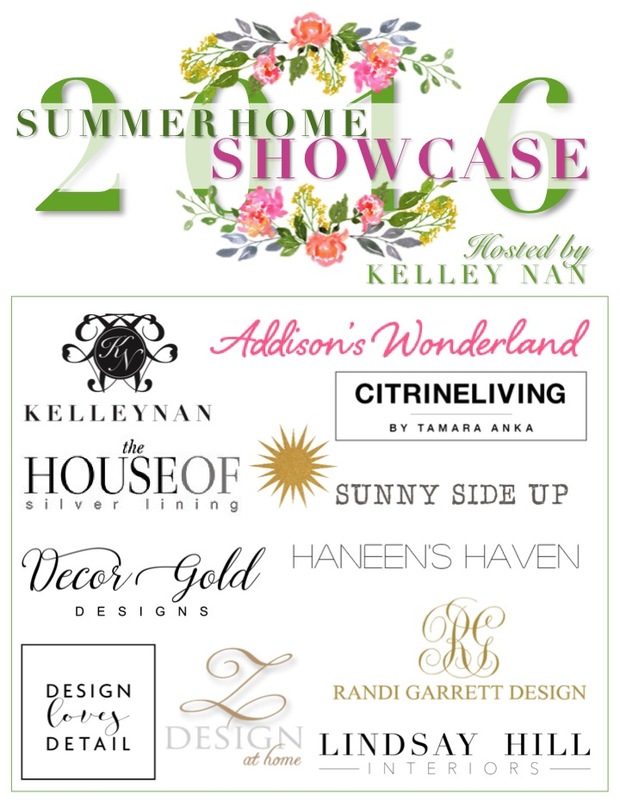 Browsing the homes of my blogger friends’ has become a favorite part of each new season, so this year, I rounded up 10 of my favs to share summer inspiration for the 2016 Summer Home Showcase! If you are linking over from my friend Erin’s home at Sunny Side Up, I am so glad you are here! 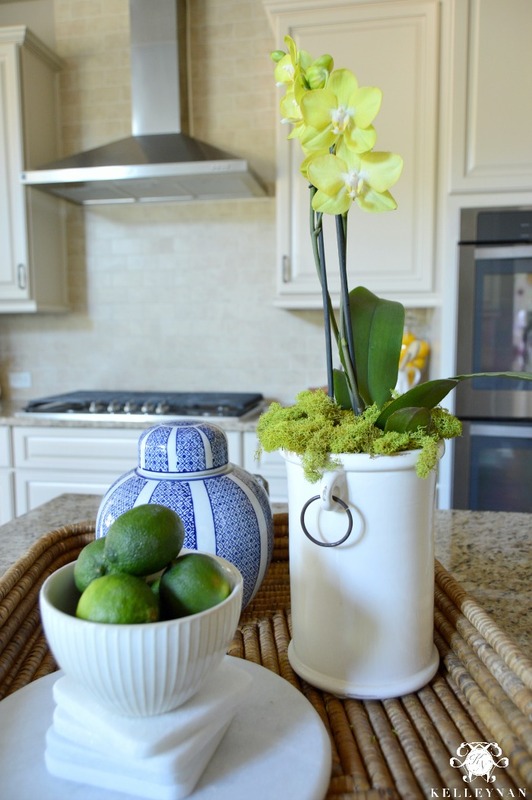 Erin’s San Diego home always makes me think of cheerful summer months and I love each thoughtful detail she put into planning her home. If you are a regular visitor, thank you for stopping by for a summer walk-through, and if this is your first time, you can read a little more about me HERE. If you have already visited other homes in the Showcase, I hope you have picked up little nuggets of inspiration at each stop. 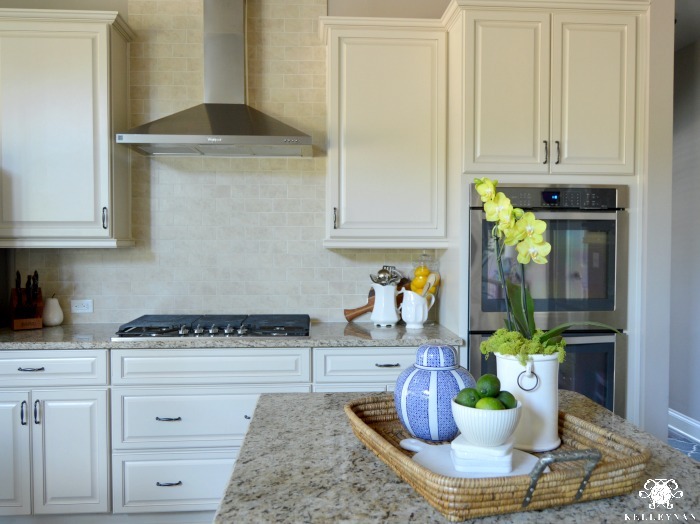 I will send you on to the next house at the end of my tour, but here is a little preview of homes you won’t want to miss. 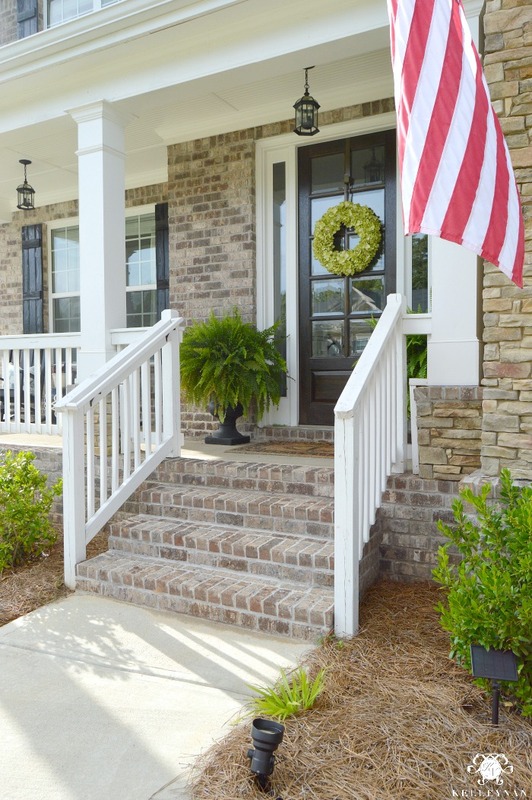 First though, I would love to greet you on the front porch of my north Georgia home and welcome you inside to show you around. My front porch has three basic “hot zones” that get seasonal decor switch-ups. 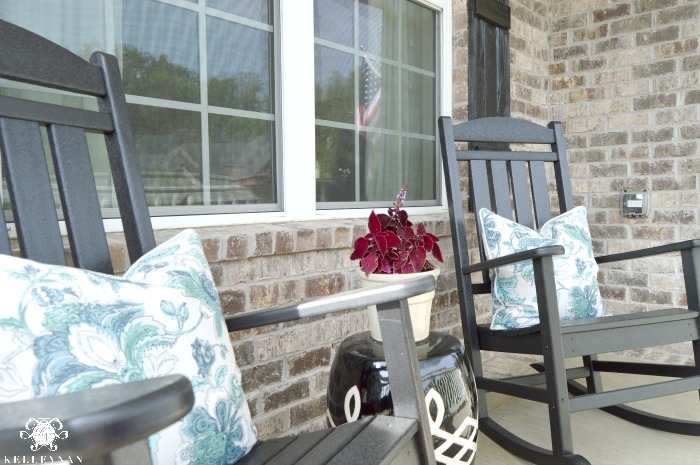 The pillows on the rockers, the front door wreath (I love making my own simple hydrangea wreaths which you can read about HERE), and the goodies in the big urns that flank my front door. As long as ferns are available, ferns is what you will most likely find 😉 I found myself in a serious love affair with coleus last summer after I realized how hearty and low maintenance it was. Now, it is without a doubt my plant of choice. I have a few varieties on my back deck that I will be sharing in a few weeks. When you first walk in, the first space you will probably notice is my dining room to the right. Even if it was hidden, I would still love creating tablescapes, but having this area as such a prominent spot in our home makes it even more fun to constantly change out the table themes. 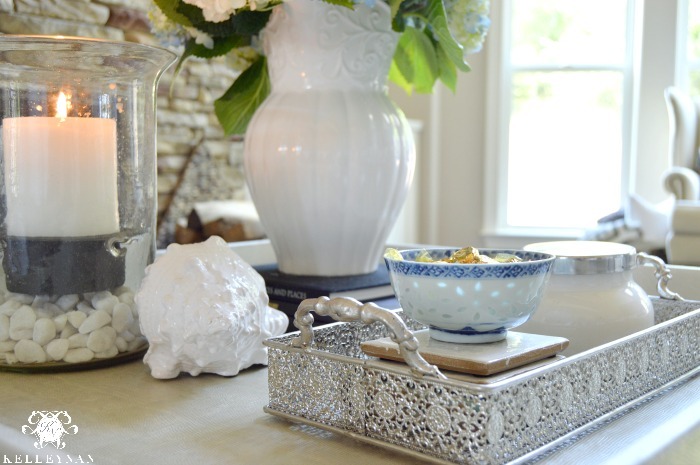 You can see some of my tablescapes HERE. Creating tables is basically my “play time”. Right now, I have a super simple, fresh table setup for summer. The dining room recently received a little facelift which you can find HERE. 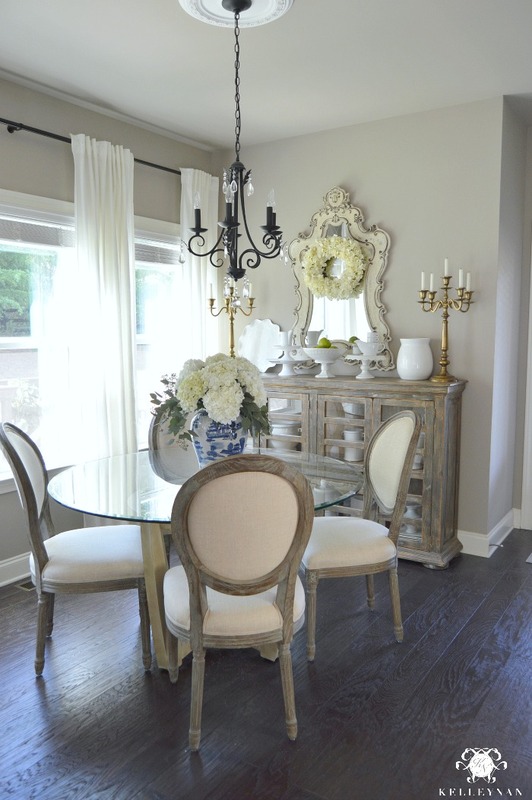 For complete sources and dining room details, click HERE. On the other side of the entry is our little sitting room. For the last month, I have had pinks blooms parading through this space on a rotating basis. I love how they look against the metallic gallery wall, sitting atop my new tufted ottoman. I’m still hunting for the perfect semi-tall “thing” for the back corner. I have had about 62 different “visions” for this room but am currently enjoying the little bit of glam. For complete sources and sitting room details, click HERE. One way I infuse a bit of warm weather indoors is using sweet little teacups to scatter blooms all over the house. 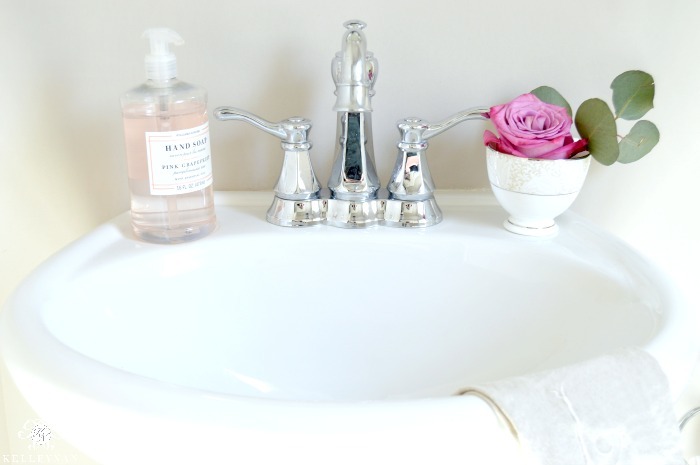 Our powder room is minimalistic so this simple embellishment is the perfect sweet accent. 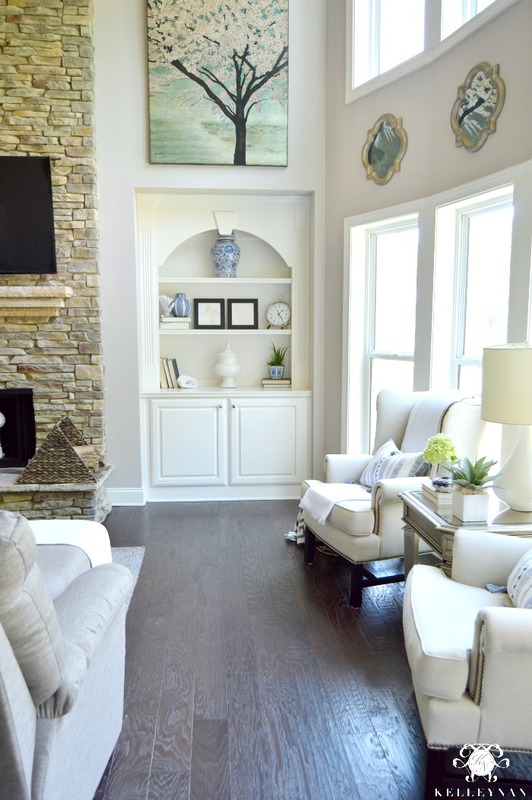 My family room always sees a seasonal update, but the neutral base lets me create new looks without undergoing complete overhauls. 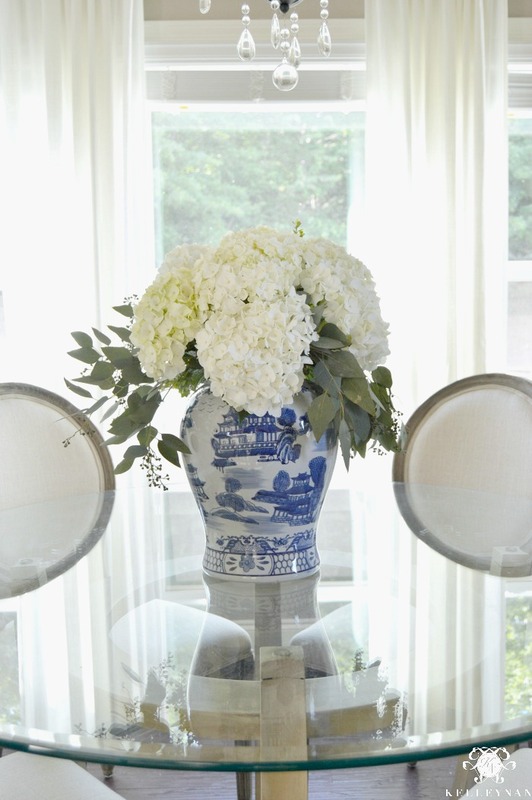 I have talked before about how much I loved my grandmother’s classic blue and white. When I inherited a few treasured pieces, I started to build my collection a little bit. This sweet little hair receiver was the first blue and white family heirloom I received. (If you don’t know what a hair receiver is, don’t worry – I didn’t either and had to look it up haha) If you follow me on Instagram, I know you have probably seen me rave about my friend Bree’s technique to reviving hydrangea blooms. Because of her advice, this little guy has been kicking for three weeks. It has seriously changed my [floral] life! 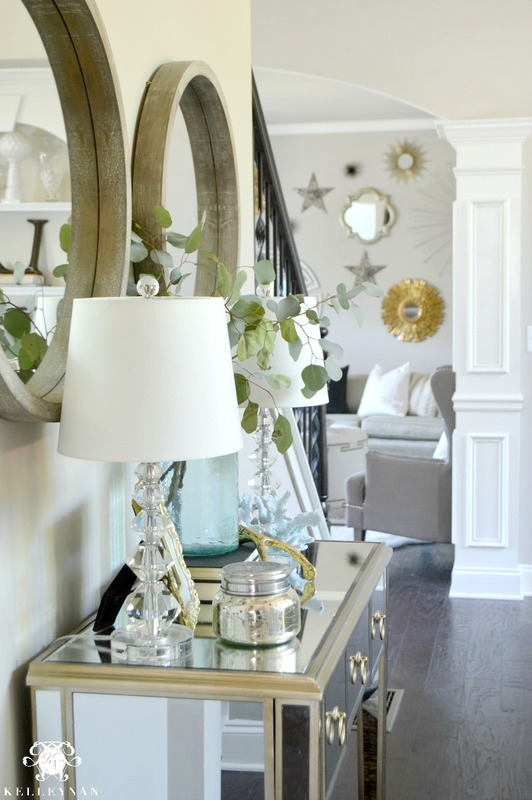 She will be sharing her home later in the tour, but you can find that golden advice HERE. I have bags of seasonal “filler” I keep on hand – moss, balls, sea glass, urchins… these haven’t made an appearance since last summer so I was thrilled to bring them back out. My husband loves an assortment of anything “nature” or “miniature” so these are some of his favorites. Here is another little treasured piece that has been passed down- a blue and white china rice bowl that is so dainty, it is translucent. 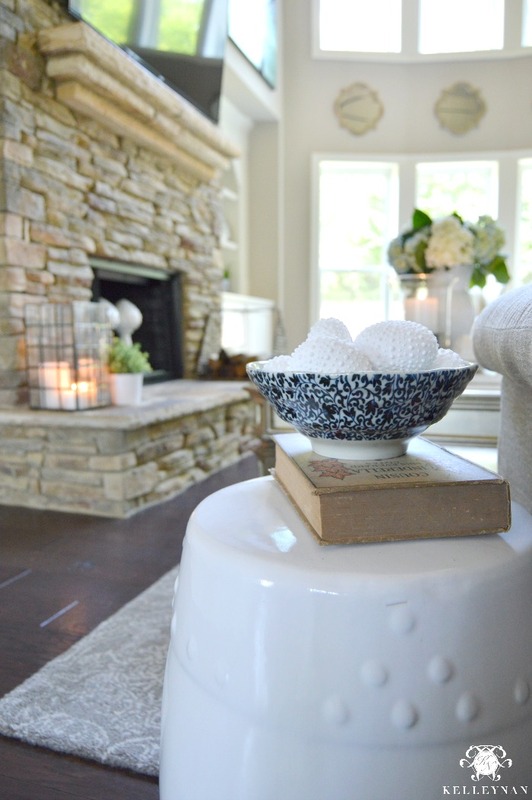 Along with teacups and flowers, I love placing little bowls with candy around the main living areas. 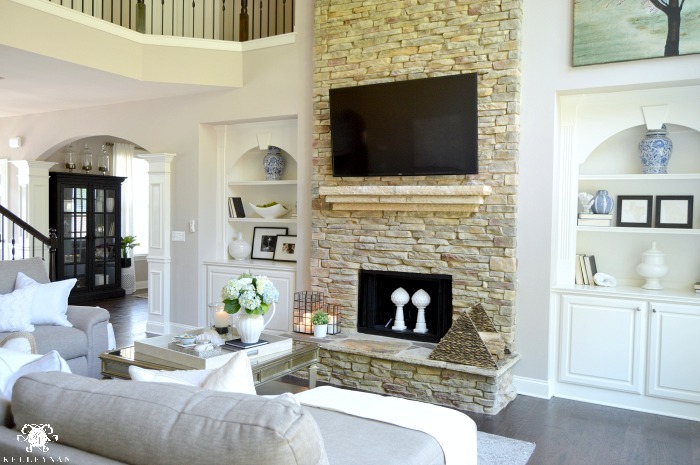 For complete sources and living room details, click HERE. 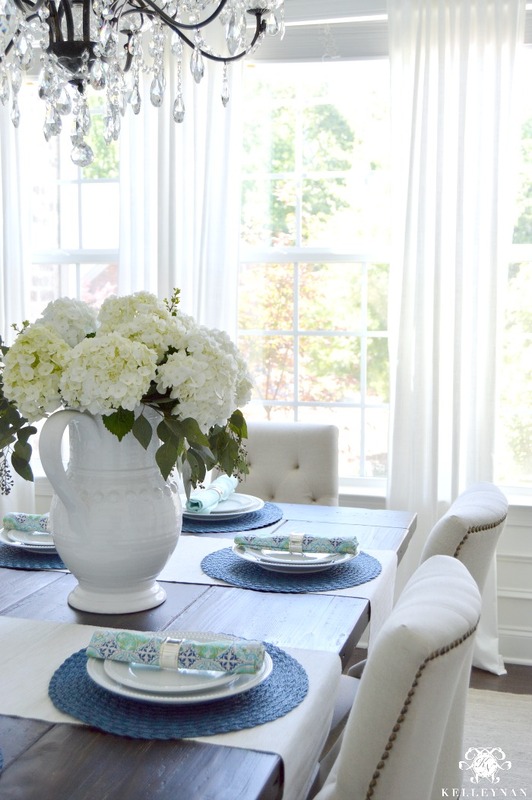 As you move into our breakfast nook, you will notice a few familiar themes – another hydrangea wreath I made and another big bunch of hydrangeas. I display a LOT of my serve ware, vases, and pitchers throughout my home on a regular basis, but have the rest of my white pieces housed in this cabinet. For our summer home transition, I did little shopping for new things, concentrating most of my efforts on simplifying and paring down what we already had. 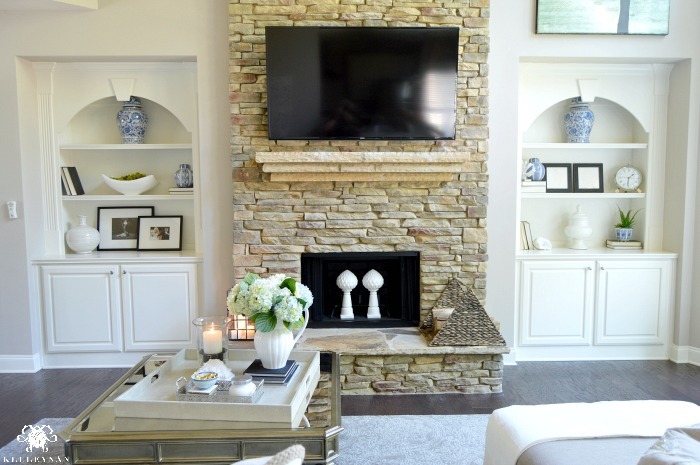 I shopped my home and moved several things around – trying to give each room a fresh, uncluttered feel. 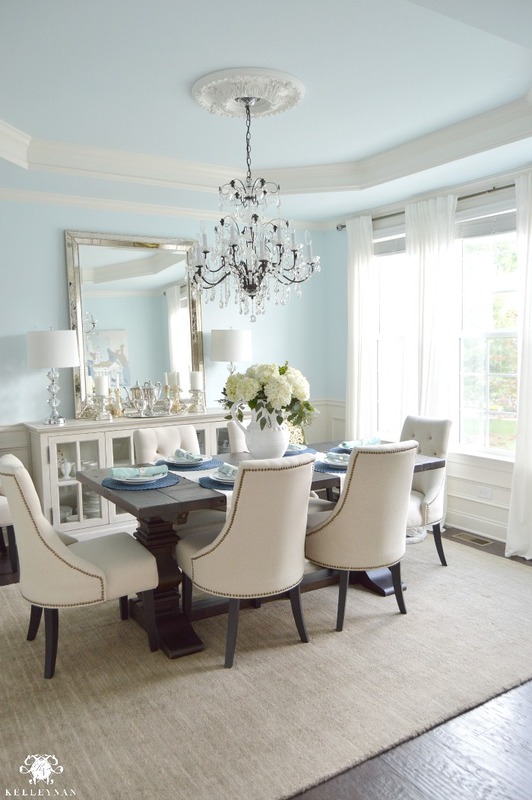 For complete sources and breakfast room details, click HERE. Adjacent to the breakfast room is my kitchen – most of our living happens within the area shown in the shot below. A few years ago, my husband and I decided we were total “cheese and wine people” after visiting our friends Jamie and Matt in Virgina. Everywhere we went, they ordered a cheese plate for the group – since then, it has become our tradition. Dave isn’t a regular wine drinker so whenever we want to make it a fun “event”, I bring out the snacks to make it a little more formal. 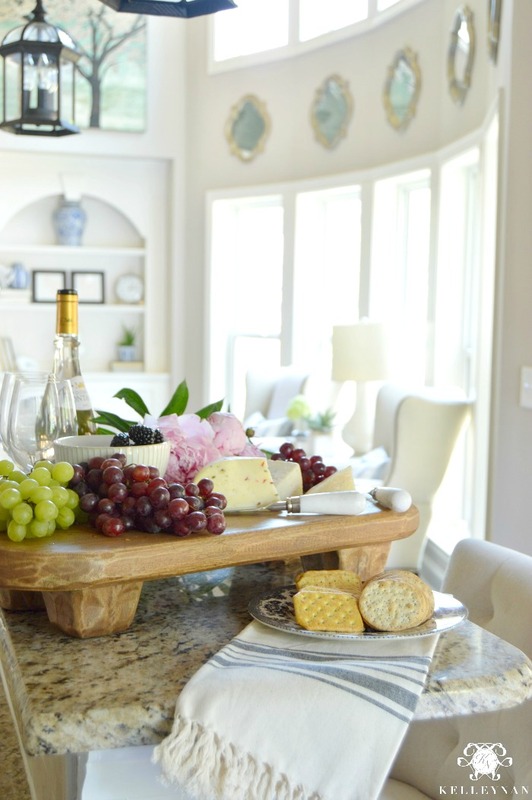 This wooden paddle pedestal (in medium) and these marble cheese knives are recent additions and they have already become a staple. I love orchids and have actually had good luck with them in the past. Whenever I bring them home, I always run through my house looking for some sort of vessel that looks like it may be able to contain the plastic pot. This is my first time using my Rhodes wine cooler, but I am kind of loving it. Since I just plopped it in there, plastic container and all, I used some moss to cover the top. For complete sources and kitchen details, click HERE. If you head upstairs to the master bedroom you may think those pillows look familiar. And, if you follow me on Instagram, you would definitely be correct. 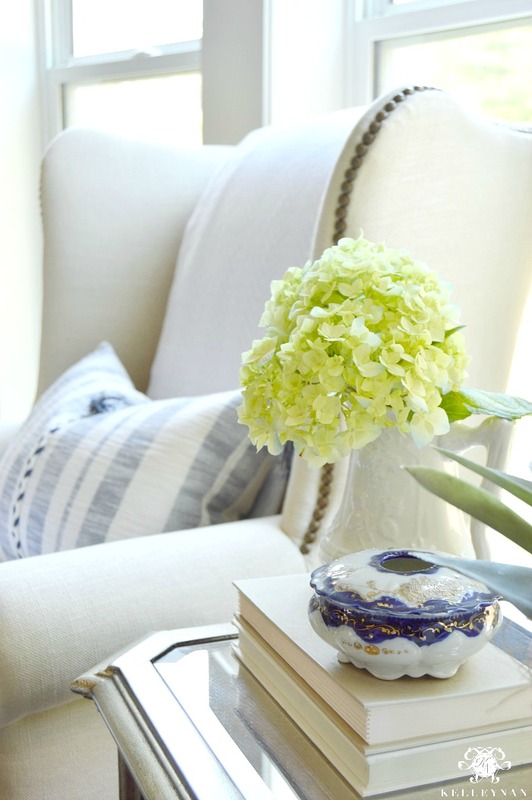 These were previously on our sofa this spring but were relocated when I brought in the fresh blue and white. 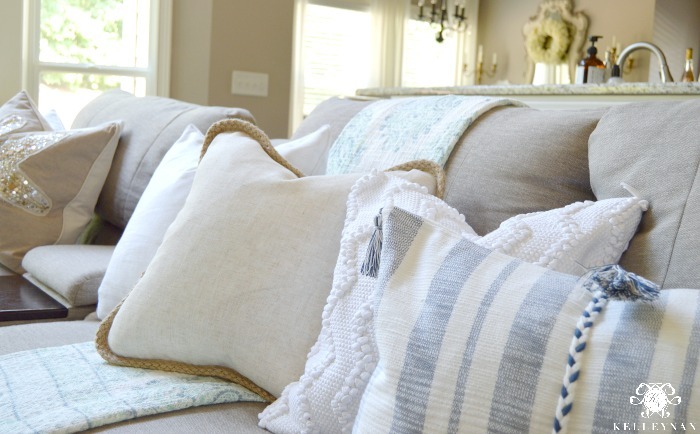 With as many pillows as we have, both displayed and stored in closets, it has become an unspoken understanding between my husband and myself. To my credit, I do use most of them throughout all seasons, moving them all around the house. To his credit, well… he tolerates it. Bless him. An area I have yet to show is the screened in porch, extending off the bedroom. This was one of the features that won us over with this particular floor plan… I should probably prioritize actually getting it semi-furnished haha. We love it but it is one of those “one day” spaces. While my mother is super ambitious, changing out her full bedding during the winter and summer, I only make small adjustments. Again, an advantage to sticking to neutral in your larger pieces allows you to alter your look easily with a few pillow and accessory edits. 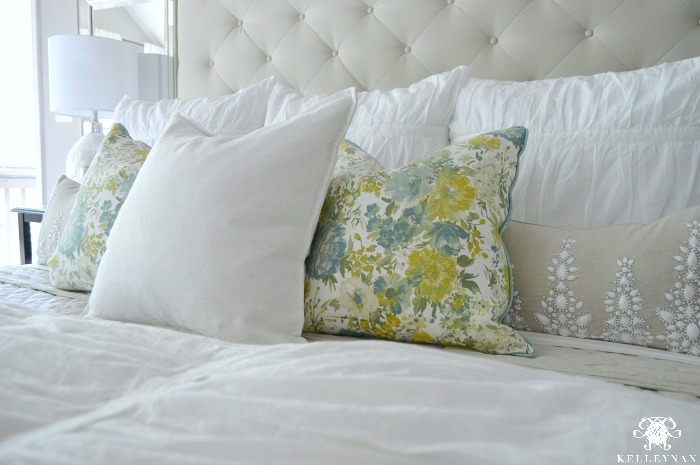 Because we use the same basic bedding year round, I wanted well made, comfortable, quality linens that would last. In particular, this Beligian Flax Linen Quilt has so totally won us over, we have it in two rooms. 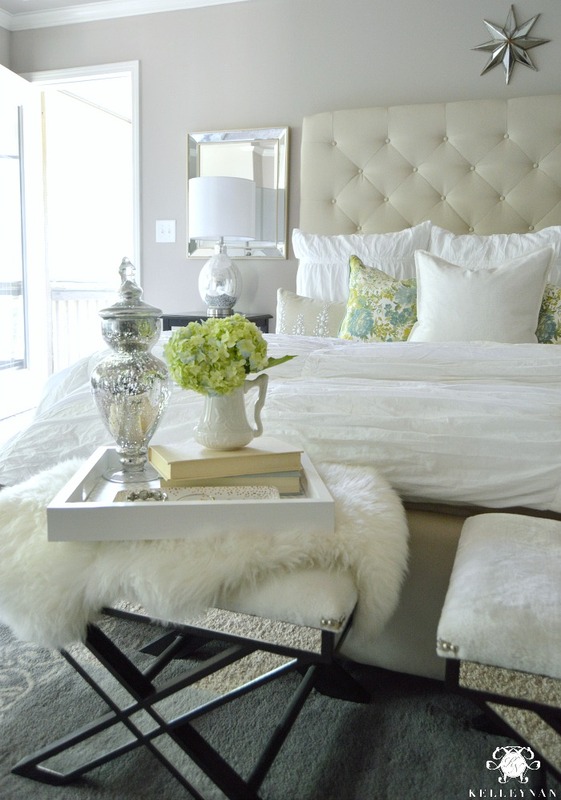 For complete sources and master bedroom details, click HERE. … and this guest room is the newly renovated space upstairs which has yet to host a guest. It shares a Jack and Jill bathroom with the afore mentioned room in desperate need of a makeover. Again, one of those “one day” spaces. 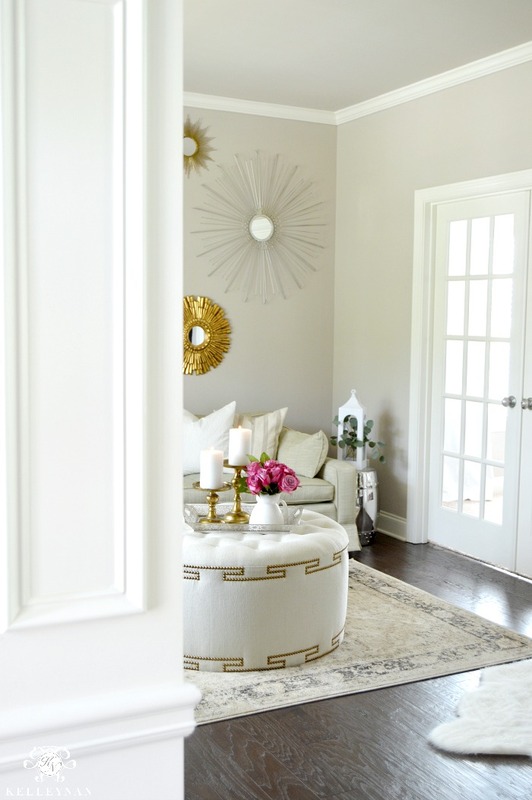 If you missed it, you can check out the full white room makeover HERE. 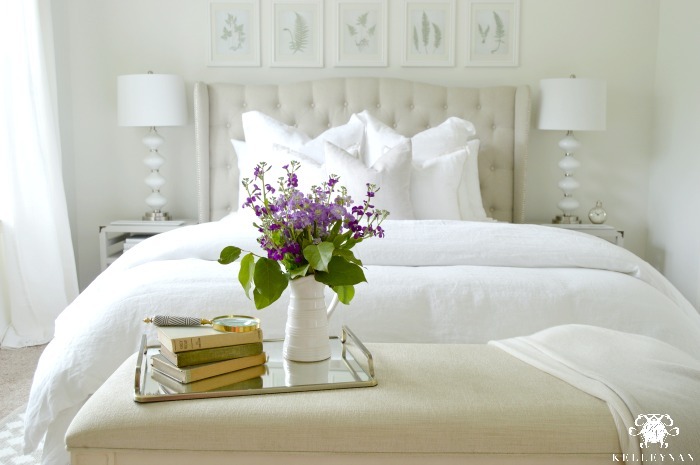 For complete sources and guest bedroom details, click HERE for the “Nan” room and HERE for the “white room”. Thank you so much for visiting with me and hanging out in my home for a bit! If this was your first time stopping by, I hope you come back soon. You can sign up for my newsletter at the bottom of the post to have updates delivered directly to your inbox. Until next time, my friends! 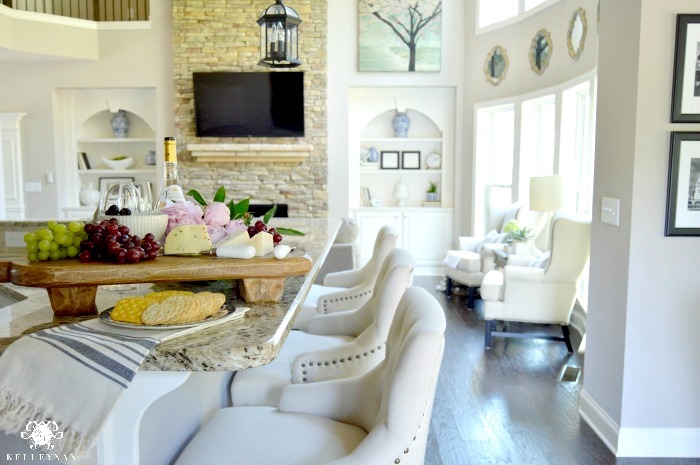 Now that we have reached the end of the tour, you will want to head on to my friend Jennifer’s home at Decor Gold Designs. 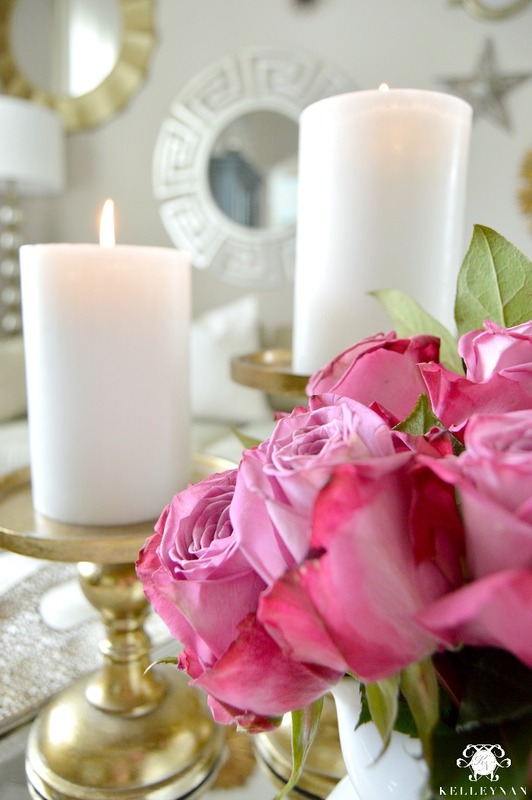 Be on the lookout for a lot of neutrals, linens, and gorgeous florals in her beautiful home. 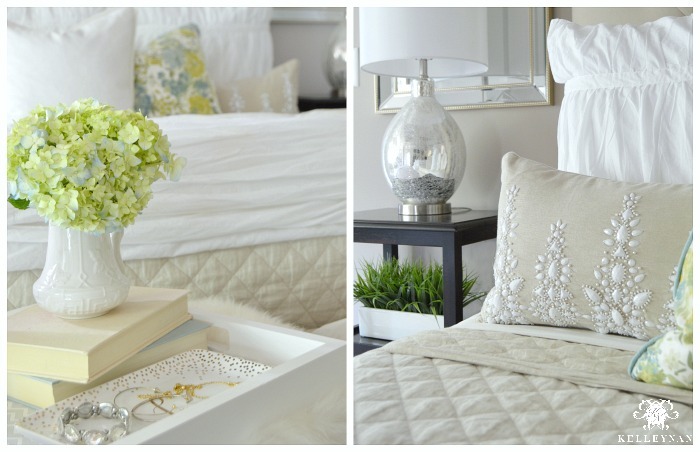 Love the touches of blue and your white bedding is stunning! Brooke, thank you so much! Have a fabulous day- I hope you are having a great start to summer with those precious babies! Kelley, it’s fabulous! 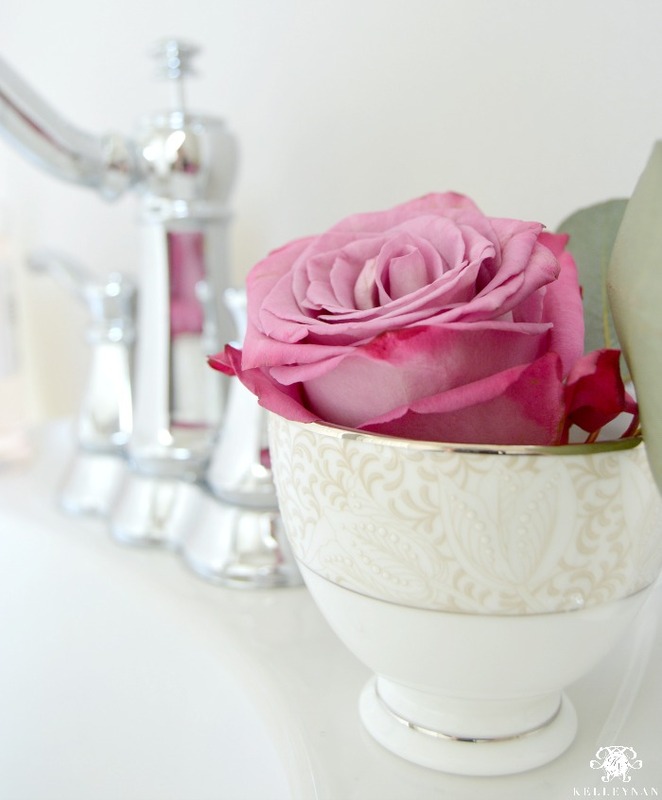 Every detail in every room is simply lovely! 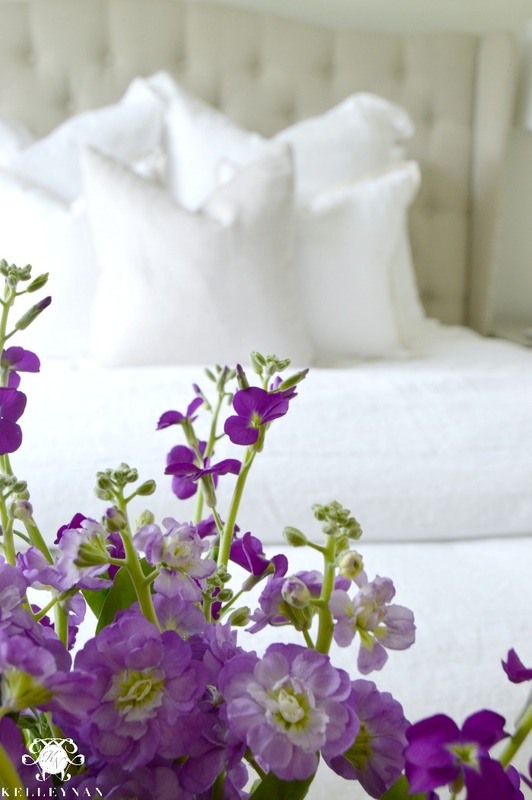 I especially adore the purple flowers in Nan’s room and your newly decorated guest room. So sweet, inviting, and beautiful. Thank you for organizing this fabulous tour!!! 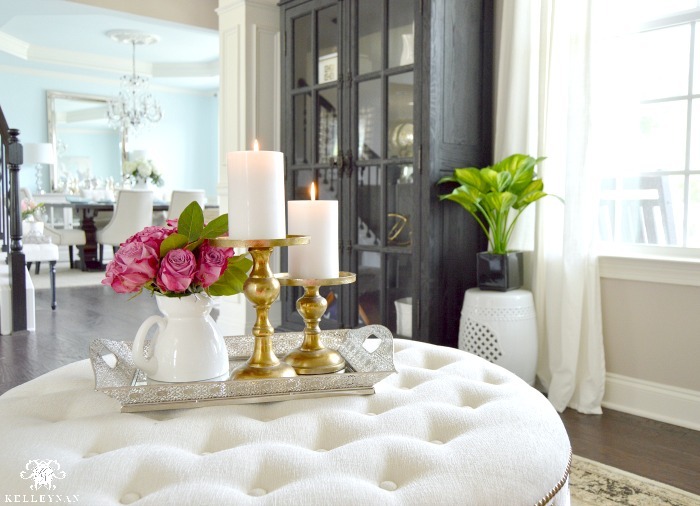 So beautiful – every detail, Kelley! I especially love your bedrooms – I don’t think I could every get up out of those gorgeous beds! Love!! Thanks for inviting me to be a part of your amazing tour! Kelley – absolute perfection, as always! 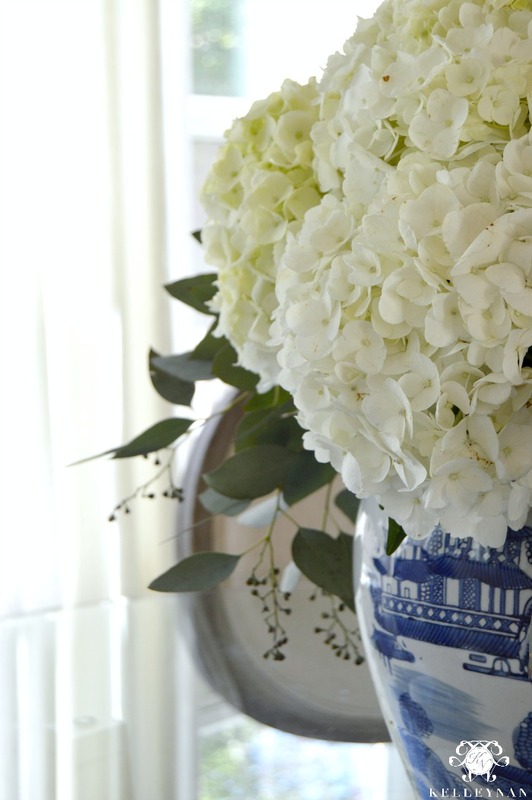 I love that your blue and white collection is growing! 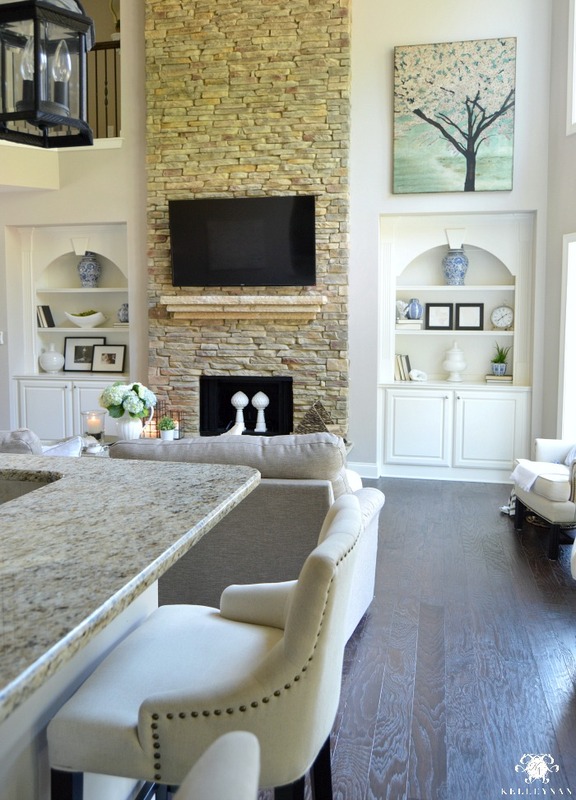 It’s gorgeous in your home! Thank you for being such a fabulous host and organizing this tour! Thank you for being such a good friend too 🙂 Love you! Thank you again for inviting me to be a part of this super fun tour! Always an honor to hang out with you girls! What a perfect tour! It’s almost as good as being there with you in person! Most amazingly is the fact that your lovely home is not only beautiful, but so comfortable and fun to visit! I am so proud that you display some of the family treasures…Loved every bit! Kelley this was stunning! 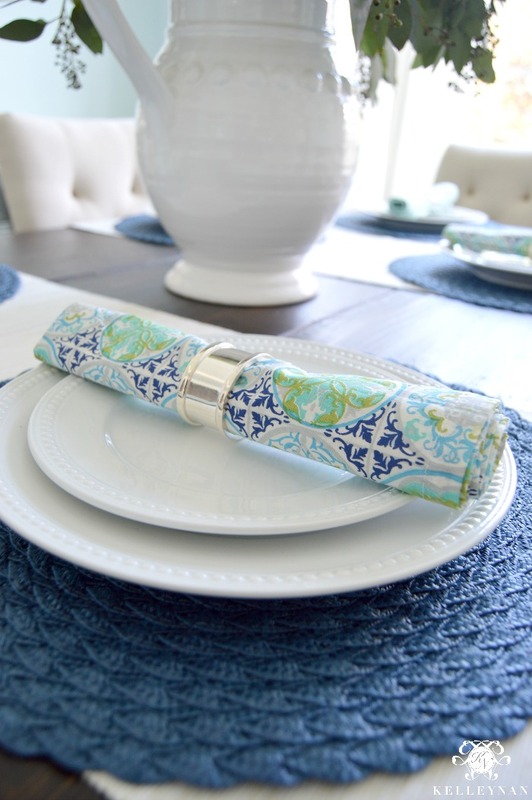 Your home is always so beautiful as well as your table settings, it is such a treat to tour through the seasons! Greetings from Houston! Every detail of this is literal perfection. I wish I had your eye for styling. Would you happen to offer online consulting? Hi, Emily- hello from Georgia! Thank you so much for your kind words. I am not currently accepting virtual clients. If I start again, I will absolutely post here! Thank you again for stopping by. Kelley, this is absolutely stunning! I’m loving all the blues and greens you incorprated for summertime. Every room looks fabulous! Kelley you have the most beautiful taste. PLEASE can you tell me where you got the cream and white beaded pillows in your bedroom..there is exactly what I have been searching for, with no luck. I fear your going to say they are no longer available. Karen, thank you so much! Unfortunately, I did purchase them over a year ago from either HomeGoods or Pier 1. I haven’t seen them since. 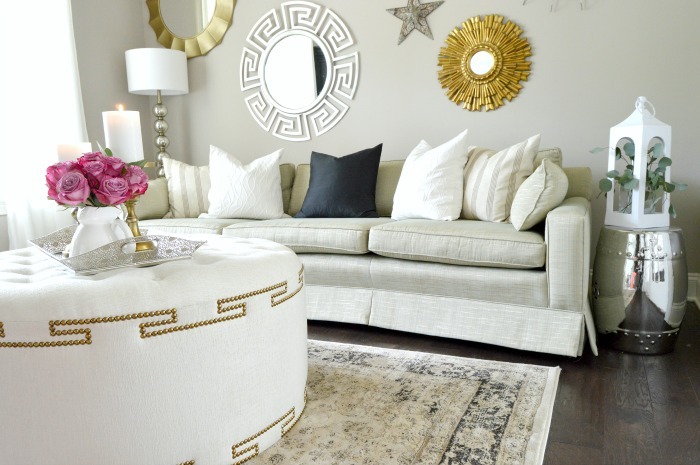 BUT, both of those places get the most beautiful embellished pillows! Hopefully you will find some from one of those stores soon! Hi.. Just browsing and came across your page.. I love the room.. The gold is just fascinating to me. I love your curtains as well.. Where are they from? And what color? 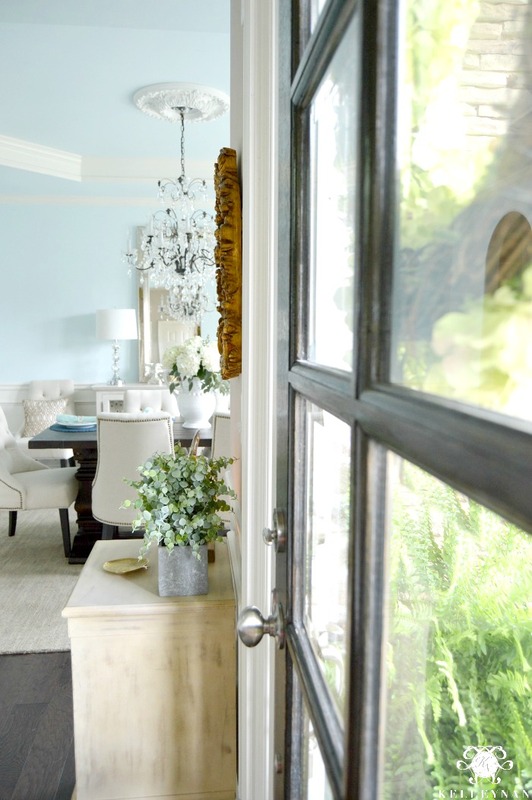 Your home is a breath of fresh air! It’s just beautiful! I’m trying to chose a paint color for my sunroom. Can you please tell me the color of your master bedroom and also your breakfast eating area? Thank you! Paige, thank you!! My master bedroom has since been painted but this past summer, it was Versatile Gray and the Breakfast Nook is a shade darker in Perfect Greige, both by Sherwin Williams.